With a sleek, modern design with a very classic Shaker influence, our Lynnwood Nightstands would look perfect next to any bed! Featuring clean, straight lines that accentuate the flush mount drawer and solid hardwood sides, the natural beauty of every grain will be perfectly showcased. 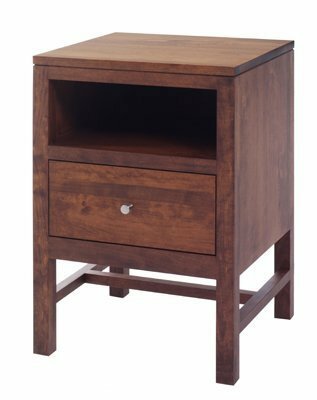 With one full-extension, dovetailed drawer and an open top shelf, this nightstand is sure to hold all of your bedside essentials for easy access when you need them! Show in Rustic Cherry Hardwood with a beautiful, Michael's Cherry Finish, the Lynnwood Nightstand is a stunning example of heirloom quality, Amish Furniture. Choose from an array of hardwood and finish options to customize the perfect nightstand to compliment your unique bedroom decor! All finally arrived safe and sound. The night stands were of very high quality and as described on the web. Certainly would recommend the product to others.